For nitriding the correct material selection is of decisive importance as the chemical analysis of the steel and its microstructure affect significantly the nitriding results. The specialists of Härterei Carl Gommann will provide you with appropriate assistance, also taking into account the individual stress on the work piece. Heat treatments are needed in steel components in order to ensure that certain properties are being given for their usage. Here, a variety of problems occur, such as: delay, changes in shape, dimensional changes, volume changes, decarburization, scaling or cracking. During the construction, these problems should be considered through heat treatment based planning. We support you with any questions; please feel free to contact the service department of Härterei Carl Gommann. The ongoing monitoring of our heat treatment processes is carried out quickly and reliably in our on-site works laboratory. This leads to continuous quality improvement and process safety. In our laboratory, we have a wide range of test options. As part of our service you may use these in the assessment of materials, their heat treatment and damage cases. Our experts will compile a practically oriented assessment in various fields of heat treatment. Nitriding treatments are very complex heat treatments. The various steel grades require individual treatment parameters to achieve optimum properties. 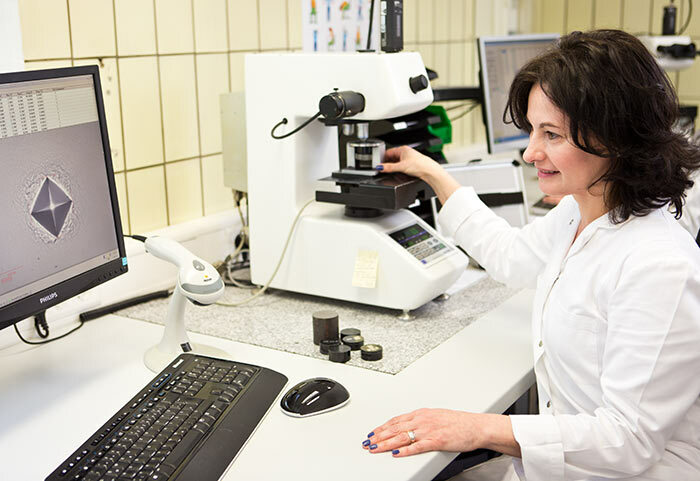 In our pilot plant, data for processes for new materials and special alloys can be identified and tested. Employee training for all industrial areas are of great importance, especially since they also are also required in the context of ISO 9001: 2000, QS 9000 and VDA 6.1. Härterei Carl Gommann offers training for the different areas of heat treatment of steels and cast iron, where you can set the scope according to your training needs. Do you have questions about our training program, then please get in touch with us - our team will be available and happy to answer your questions!